Kaleta Reserve, near Amboasary in southern Madagascar. The bird is sitting in a Tamarind tree. The Greater Vasa Parrot (Coracopsis vasa) is one of two species of Vasa Parrot, the other being the Lesser Vasa Parrot (C. nigra). The Greater Vasa Parrot can be found throughout Madagascar and the Comoros. 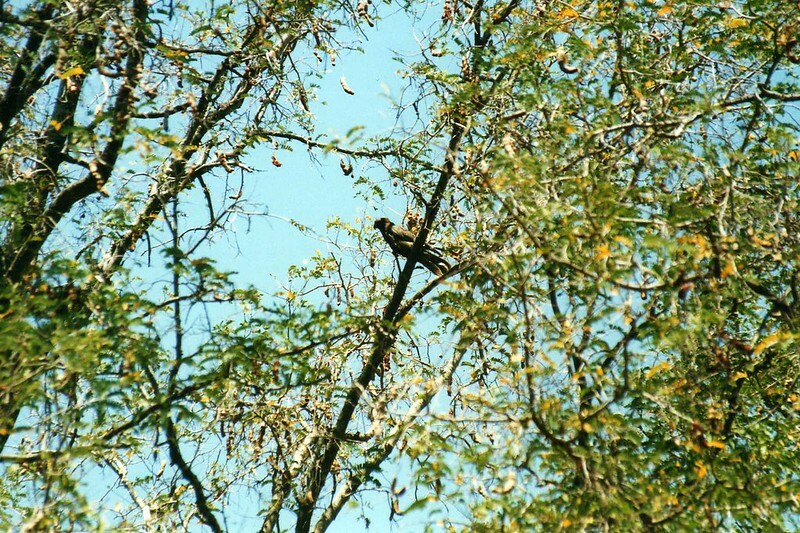 In Madagascar it is more common in portions of the Madagascar dry deciduous forests, compared with the Lesser Vasa Parrot which is more common in the humid forests of the east coast. Tamarind (Tamarindus indica) (from Latinization of Arabic: تمر هندي tamar Hind "Indian Date") is a tree in the family Fabaceae. The genus Tamarindus is monotypic (having only a single species). Tamarindus indica is indigenous to tropical Africa, particularly where it continues to grow wild in Sudan – it is also cultivated in Cameroon, Nigeria and Tanzania. In Arabia it is found wild growing in Oman, especially Dhofar, where it grows on sea-facing mountains. It reached South Asia likely through human transportation, and cultivation several thousand years prior to the Common Era. It is widely distributed throughout the Tropical belt, from Africa to South Asia, and throughout South East Asia, Taiwan and as far as China. In the 16th century it was heavily introduced to Mexico, as well as South America, by Spanish and Portuguese colonists, to the degree that it became a common ingredient in everyday living. One of the first tamarind trees in Hawaii was planted in 1797. The tamarind is a long-lived, medium-growth bushy tree which attains a maximum crown height of 12.1 to 18.3 metres (40 to 60 feet). The crown has an irregular vase-shaped outline of dense foliage. The tree grows well in full sun in clay, loam, sandy, and acidic soil types, with a high drought and aerosol salt (wind-borne salt as found in coastal area) resistance. Leaves are evergreen, bright green in colour, elliptical ovular, arrangement is alternate, of the pinnately compound type, with pinnate venation and less than 5 cm (2 inches) in length. The branches droop from a single, central trunk as the tree matures and is often pruned in human agriculture to optimize tree density and ease of fruit harvest. At night, the leaflets close up. The tamarind does flower, though inconspicuously, with red and yellow elongated flowers. Flowers are 2.5 cm wide (one inch) five-petalled borne in small racemes, yellow with orange or red streaks. Buds are pink as the 4 sepals are pink and are lost when the flower blooms. The fruit is an indehiscent legume, sometimes called a pod, 12 to 15 cm (3 to 6 inches) in length with a hard, brown shell. The fruit has a fleshy, juicy, acidulous pulp. It is mature when the flesh is coloured brown or reddish-brown. The tamarinds of Asia have longer pods containing 6-12 seeds, whereas African and West Indian varieties have short pods containing 1-6 seeds. The seeds are somewhat flattened, and glossy brown. The tamarind is best described as sweet and sour in taste, and high in acid, sugar, vitamin B and, interestingly for a fruit, calcium. As a tropical species, it is frost sensitive. The pinnate leaves with opposite leaflets giving a billowing effect in the wind. Tamarind timber consists of hard, dark red heartwood and softer, yellowish sapwood. Tamarind is harvested by pulling the pod from its stalk. A mature tree may be capable of producing up to 175 kg (350 lb) of fruit per annum. Veneer grafting, shield (T or inverted T) budding, and air layering may be used to propagate desirable selections. Such trees will usually fruit within 3 to 4 years if provided optimum growing conditions. Globally, it is most numerous in South Asia, where it is widely distributed and has a long history of human cultivation. Many South Asian regional languages have their own unique name for the tamarind fruit. It is called the tetul (তেঁতুল) in Bangla; in India it is known in several languages. In Sanskrit, it is called tintiDi. In Oriya it is called tentuli, in Hindi it is called imli; In Gujarati the amli, and Marathi and Konkani the chinch; in Kannada it is called hunase (ಹುಣಸೆ), Telugu chintachettu (tree) and chintapandu (fruit extract) and in Malayalam its called Vaalanpuli (വാളന്‍പുളി ). In Pakistan in Urdu it is known as imli. In Sri Lanka in Sinhala call it the siyambala; and Northern areas in Tamil also as the puli (புளி). In the Cook Islands in Cook Islands Maori Māori Kūki Āirani or Rarotonganis language Tamarindus is called ‘tamarene’. In Indonesia, tamarind is known as the asam (or asem) Jawa (means Javanese asam), which in the Indonesian language, translates as Javanese sour [sic: fruit] (though the literature may also refer to it as sambaya). In Malaysia, it is also called "asam Jawa". In the Philippines, tamarind is referred to as Sampaloc, which is occasionally rendered as Sambalog in Tagalog and Sambag in Cebuano. Vietnamese term is me. In Taiwan it is called loan-tz. In Myanmar it is called magee-bin (tree) and magee-thee (fruit). The tamarind is the provincial tree of the Phetchabun province of Thailand (in Thailand it is called ma-kham). In Malagasy it is called voamadilo and kily. In Colombia, Dominican Republic, Mexico, Puerto Rico and Venezuela it is called tamarindo. In the Caribbean, tamarind is sometimes called tamon. Tamarind (Tamarindus indica) should not be confused with the Manila tamarind (Pithecellobium dulce), which is a different plant, though also of Fabaceae. The fruit pulp is edible and popular. The hard green pulp of a young fruit is considered by many to be too sour and acidic, but is often used as a component of savory dishes, as a pickling agent or as a means of making certain poisonous yams in Ghana safe for human consumption. The ripened fruit is considered the more palatable as it becomes sweeter and less sour (acidic) as it matures. It is used in desserts as a jam, blended into juices or sweetened drinks, sorbets, ice-creams and all manner of snack. It is also consumed as a natural laxative. In Western cuisine it is found in Worcestershire sauce, and HP sauce. In Indian cuisine it is common. Imli Chutney and Pulusu use it. Along with tamarind, sugar and spices are added to (regional) taste for chutneys or a multitude of condiments for a bitter-sweet flavor. The immature pods and flowers are also pickled and used as a side dish. Regional cuisines such as Rajasthan, Maharashtra, Tamil Nadu and Andhra Pradesh use it to make Rasam, Sambhar, Vatha Kuzhambu and Puliyogare. In Andhra Pradesh and Tamil Nadu, tender leaves of tamarind are used along with lentils and it is also dried and used in place of ripe tamarind for mild flavour. In Guadeloupe, tamarind is known as Tamarinier and is used in jams and syrups. In Mexico, it is sold in various snack forms: dried and salted; or candied (see for example pulparindo or chamoy snacks). The famous agua fresca beverage, iced fruit-bars and raspados all use it as the main ingredient. In the US, Mexican immigrants have fashioned the "agua de tamarindo" drink, the Jarritos Tamarind drink (the first introduced and second most popular flavour of the brand), and many other treats. Tamarind snacks such as Mexico’s Pelon Pelo Rico, are available in specialty food stores worldwide in pod form or as a paste or concentrate. In Egypt, a sour, chilled drink made from tamarind is popular during the summer. A traditional food plant in Africa, tamarind has potential to improve nutrition, boost food security, foster rural development and support sustainable landcare. In southern Kenya, the Swahili people use it to garnish legumes and also make juices. In Madagascar, its fruits and leaves are a well-known favorite of the Ring-tailed Lemurs, providing as much as 50% of their food resources during the year if available. In Northern Nigeria, it is used with millet powder to prepare Kunun Tsamiya, a traditional Pap mostly used as breakfast, and usually eaten with bean cake. The Javanese dish gurame and more so ikan asem, also known as ikan asam (sweet and sour fish, commonly a carp or river-fish) is popular throughout Indonesia, Malaysia and Singapore. Tamarind is also common in Manado, Sulawesi and Maluku cuisines. In Lebanon, the Kazouza company sells a tamarind-flavoured carbonated beverage. In Myanmar, young and tender leaves and flower buds are eaten as a vegetable. A salad dish of tamarind leaves, boiled beans, and crushed peanuts topped with crispy fried onions is very popular in rural Myanmar. In the Philippines, tamarind is used in foods like sinigang soup, and also made into candies. The leaves are also used in sinampalukan soup. In Thailand a specific cultivar has been bred specifically to be eaten as a fresh fruit, famous for being particular sweet and minimally sour. It is also sometimes eaten preserved in sugar with chili as a sweet-and-spicy candy. Pad Thai, a Thai dish popular with Westerners often include tamarind for its tart/sweet taste (with lime juice added for sourness and fish sauce added for saltiness). A tamarind-based sweet-and-sour sauce served over deep-fried fish is also a common dish in central Thailand. Phytochemical studies revealed the presence of tannins, saponins, sesquiterpenes, alkaloids and phlobatamins and other extracts active against both gram positive and gram negative bacteria, at temperatures of 4–30 °C (39–86 °F). Studies on the minimum inhibitory concentration (MIC) and minimum bactericidal concentration (MBC) of the extracts on the test organisms showed that the lowest MIC and the MBC were demonstrated against Salmonella paratyphi, Bacillus subtilis and Salmonella typhi and the highest MIC and MBC was exhibited against Staphylococcus aureus. Throughout Asia and Africa it is common for health remedies. In Northern Nigeria, fresh stem bark and fresh leaves are used as decoction mixed with potash for the treatment of stomach disorder, general body pain, jaundice, yellow fever and as blood tonic and skin cleanser. In Indonesia, Malaysia and Philippines and Javanese traditional medicine use asem leaves as a herbal infusion for malarial fever, the fruit juice as an anti-septic, and scurvy and even cough cure. Fruit of the tamarind is also commonly used throughout South East Asia as a poultice applied to foreheads of fever sufferers. Tamarind is used as in Indian Ayurvedic Medicine for gastric and/or digestion problems, and in cardioprotective activity. In animal studies, tamarind has been found to lower serum cholesterol and blood sugar levels. Due to a lack of available human clinical trials, there is insufficient evidence to recommend tamarind for the treatment of hypercholesterolemia (high cholesterol) or diabetes. Based on human study, tamarind intake may delay the progression of fluorosis by enhancing excretion of fluoride. However, additional research is needed to confirm these results. Excess consumption has been noted as a traditional laxative. Other medicinal uses include: Anthelminthic (expels worms), antimicrobial, antiseptic, antiviral, asthma, astringent, bacterial skin infections (erysipelas), boils, chest pain, cholesterol metabolism disorders, colds, colic, conjunctivitis (pink eye), constipation (chronic or acute), diabetes, diarrhea (chronic), dry eyes, dysentery (severe diarrhea), eye inflammation, fever, food preservative, food uses (coloring), gallbladder disorders, gastrointestinal disorders, gingivitis, hemorrhoids, indigestion, insecticide, jaundice, keratitis (inflammation of the cornea), leprosy, liver disorders, nausea and vomiting (pregnancy-related), paralysis, poisoning (Datura plant), rash, rheumatism, saliva production, skin disinfectant/sterilization, sore throat, sores, sprains, sunscreen, sunstroke, swelling (joints), urinary stones, wound healing (corneal epithelium). In temples, especially in Buddhist Asian countries, the fruit pulp is used to polish brass shrine furniture, removing dulling and the greenish patina that forms. The wood is a bold red color. Due to its density and durability, tamarind heartwood can be used in making furniture and wood flooring. A tamarind switch is sometimes used as an implement for corporal punishment. Tamarind trees are very common throughout Asia and the tropical world as both an ornamental, garden and cash-crop. The tamarind has recently become popular in bonsai culture, frequently used in Asian countries like Indonesia, Taiwan and the Philippines. In the last Japan Airlines World Bonsai competition, Mr. Budi Sulistyo of Indonesia won the second prize with an ancient tamarind bonsai. The seeds are sometimes used by children in traditional board games such as Chinese checkers (China), Dhakon (Java), and others. The tamarind tree is the official plant of Santa Clara, Cuba. Consequently it appears in the coat of arms of the city. Image published by wallygrom on 2009-04-18 22:03:15 and used under Creative Commons license.